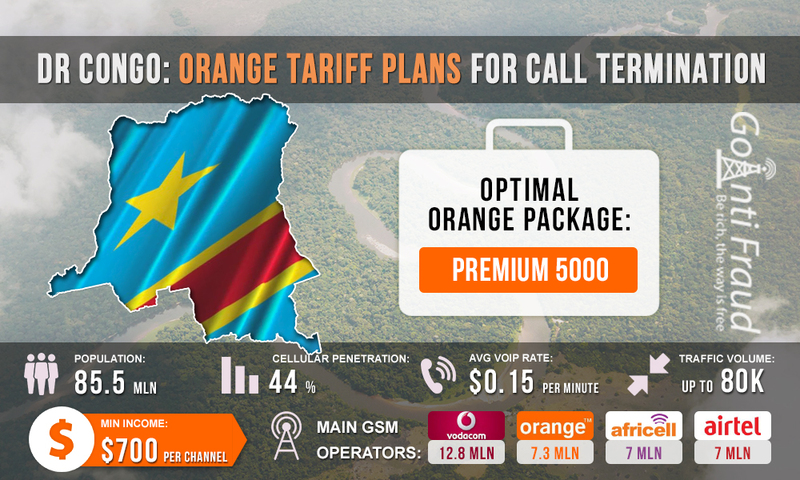 Orange is the second largest mobile operator in the Democratic Republic of the Congo in terms of subscriber base. Its services are used by more than 7.3 million subscribers. Orange boosted its position in 2016, when it bought a local company Oasis, which operated under Tigo brand. Orange is also the leader in the mobile Internet sector in the country. Orange's starting plans are suitable for doing business on call termination, if you connect an inexpensive tariff plan. The operator's SIM cards are called SIM Bilengi and are sold both at Orange’s stores and by street vendors. You can buy the starting plans in the Democratic Republic of the Congo without presenting your ID documents. Once having activated your SIM card, connect the right package for profitable calls. PREMIUM 1000. The subscriber gets 100 minutes to make calls within the Orange network and 20 minutes to other networks. The cost of this package is $ 0.64. Duration - 15 days. PREMIUM 2000. The subscriber gets 200 minutes to make calls within the Orange network and 20 minutes to other networks. The cost of this package is $ 1.28. Duration - 30 days. PREMIUM 5000. The subscriber gets 500 minutes to make calls within the Orange network and 20 minutes to other networks. The cost of this package is $3.1. Duration - 30 days. To work in voip traffic termination business, PREMIUM 5000 call plan will be best suited. Using it, you will ensure the per minute cost of a call of about $0.06. Terminating for 300 minutes a day, an entrepreneur will earn about $800 (from one GSM gateway port).